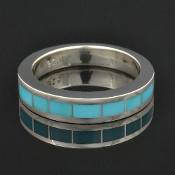 Women's sterling silver rings featuring turquoise or spiderweb turquoise inlay mixed with other inlay materials and gemstones or just turquoise alone. 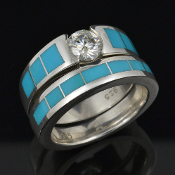 The turquoise in these rings comes in a variety of colors and spiderweb patterns and can be inlaid in sterling silver, stainless steel or gold. 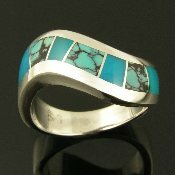 Spiderweb Turquoise Ring in Sterling Silver Silver ring inlaid with Australian opal, turquoise, gem silica Spiderweb turquoise and gem silica inlaid silver ring. 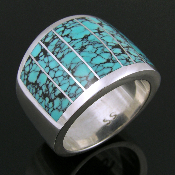 Spiderweb turquoise inlay ring in sterling silver by Mark Hileman. 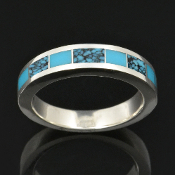 Beautiful wide band inlaid with 7 pieces of spider web turquoise. 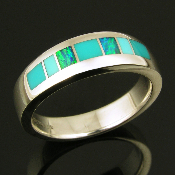 Ladies handmade sterling silver ring inlaid with Australian opal, turquoise and gem silica. 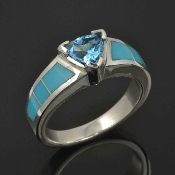 The center and end sections of inlay are translucent blue gem silica. 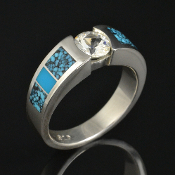 Ladies curved channel ring inlaid with spiderweb turquoise and gem silica by jewelry artist Mark Hileman. 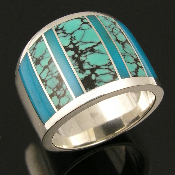 Sterling silver ring inlaid with spiderweb turquoise and gem silica by Mark Hileman. 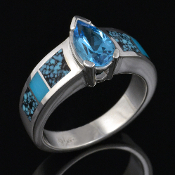 Beautiful translucent blue gem silica combined with awesome black matrix spiderweb turquoise make a very striking ring. 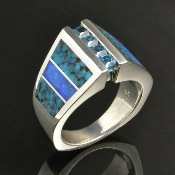 Unique spiderweb turquoise and Australian opal inlay sterling silver ring by Hileman. 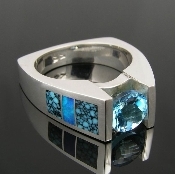 The turquoise and opal inlay is accented by 4 princess cut blue topaz channel set in this handmade sterling silver ring. 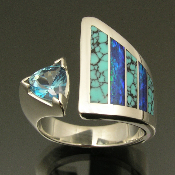 Unique handmade woman's sterling silver blue topaz ring inlaid with Australian opal and spiderweb turquoise. 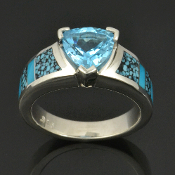 A sparkling .75 carat trillion cut blue topaz is accented by 2 pieces of inlaid blue Australian opal and 3 pieces of inlaid spiderweb turquoise. 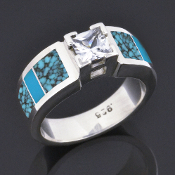 Woman's sterling silver ring band inlaid with black onyx and blue spiderweb turquoise. 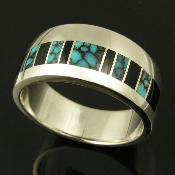 Silver band by Mark Hileman measures 9.5mm wide at the top. 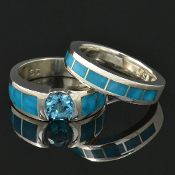 All of the turquoise and spiderweb turquoise rings shown here will be made to order in your ring size in 3 to 5 weeks. 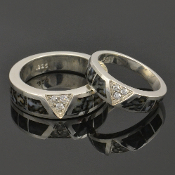 You may customize the stone arrangement and colors on most rings. Contact us for details and a price quote.